The Orthodox Church of Saint Athanasios in Dhermi has been completely demolished in the middle of the night. May God lead us and help us in our time of need. 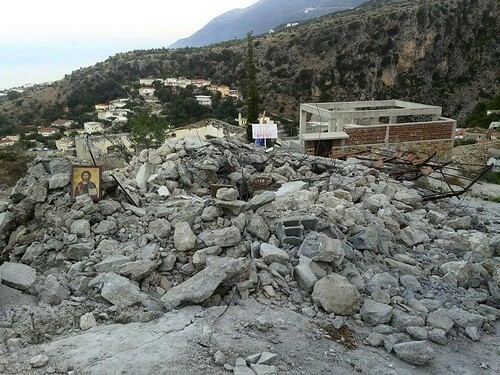 Today on August 26, 2015, before dawn at around 4 o’clock in the morning, in order not to confront the residents of Dhermi in Himara, the Orthodox church of St. Athanasius was secretly and insidiously destroyed by construction inspection forces which were brought from other areas of the country. It was dejecting and offensive to see the Holy Gospel, the Icons and the sacred objects buried under the rubble. This act reminds us of the desecration at St. Mary's Church in Permet, where the holy objects were thrown into a garbage truck. This action is a flagrant violation of the Law no. 10057, 22.01.2009, "On ratification of the Agreement between the Government of the Republic of Albania and the Orthodox Church of Albania", Article 21 / 1,2 according to which "Buildings and facilities which serve for religious ceremonies and services are considered sacred by the Orthodox Autocephalous Church of Albania. The intervention of the state authorities is prohibited, except in cases of urgency when it is required pursuant to an order of prosecution, a judicial or executive title, or in case of threat of an imminent danger. 2. The inviolability of public space is guaranteed by the State. The State protects religious objects and religious areas, in accordance with the Law. "The intervention was made without prior official or informal notification and the clergy were ignored. The hierarchical representatives, Protopresbyter Fr. Pandeli Mitru, Fr. Efthim Bixhili and Fr. Athanasius Kareem demanded an explanation by local authorities. From the beginning, those who had planned the destruction of this holy place were contradictory, megalomaniac and inconsistent throughout their statements, claims, and actions. They stated that the church was an illegal construction recently built. However, the church was erected by the faithful at the dawn of Democracy (over 20 years ago), in the same place where the old church had been destroyed by the Communist Regime. They said that it was a monument of culture but this is not true. They stated that it was not under the possession of the Orthodox Autocephalous Church of Albania, but documents prove the opposite. They stated that the concrete layer was laid at the walls of the historic old church and then it was flattened etc. This event is a violation of the universal right of belief and secularism promulgated at the Constitution of the State, which privately undertakes the demolition of an object of religion to establish another one by undertaking initiatives and commitments that do not belong or comprise with the internal religious issues. Such irresponsible and reckless actions endanger religious harmony in the country bringing up conflicts among religions and religious communities. This action occurs at a time when the Orthodox Autocephalous Church of Albania, along with the community of Saint Egidios and the Catholic Church in Albania, are preparing an event in September in early to organize a great interreligious activity "Peace is Always Possible." This is a historic event for Albania. It will be attended by 500 delegates from 30 different religious communities from all over the world. Such actions undertaken against the Orthodox Autocephalous Church of Albania are in opposition to the spirit of the event and provoke and distort the image of our country and its people.